Preparations are underway for the 2018-2019 Fall-Winter Mid America High School Hockey League. Registration: Player registration and fee payments for JV and Varsity players will be made here on the KCYHA website using the below link. Please refer to your clubs page within this website for fee information. 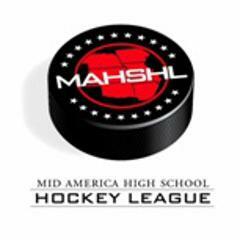 Game Schedule & Standings: The league game schedule, stats & standings will be on the MAHSHL website when ready. See link on right. No league games will be played Thanksgiving or Christmas weekends. High School player registration is OPEN for Carriage Club, Jr Mavs, Saints, Stars, St Joseph & Rockhurst. During registration---make sure you select your Division as "Local High School (MAHSHL)", then select the club/district you are playing with. MAHSHL players/teams are divided by district. Click the following link to find which district you are in and which club you should play for. If you play for one of the out of town clubs including Springfield, Springdale, Mid Missouri, & Wichita, please refer to your local association coach or team manager for registration information. The Registration "High School League" is not currently available.